The effect of water deprivation on the pharmacokinetic parameters of antipyrine and sulphadimidine in the Nubian goat was studied. Water deprivation, to a level of dehydration at which the animals lost an average of 7.5% body weight, resulted in a significant reduction in antipyrine clearance (p<0.05), and a consequently increased AUC value (p<0.05). No effect was observed on the distribution parameters of the drug. 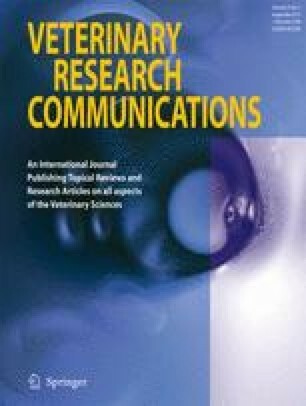 In dehydrated animals which had lost an average of 10% or 12.5% of their body weight owing to water deprivation, significant changes were found in the distribution and elimination pharmacokinetic parameters of antipyrine and sulphadimidine. The volume of distribution was significantly decreased, resulting in elevated plasma levels for the two drugs compared to normally watered animals. Significant decreases in clearance and subsequent prolongation of the elimination half-lives were observed during these periods of water deprivation. These changes in the disposition kinetics of the two drugs may be attributed to the loss of total body water and extracellular fluids and changes in the liver and kidney functions taking place during dehydration.